I’ve been lucky in my career to work with some awesome people. They let me into their lives with my camera and allow me to tell the story of them, their families or the celebration of their wedding day. When I get referrals from these clients, it shows me that they trust me to do the same high-quality work and provide the same great service to their friends and family. This is a responsibility I take very seriously because I want everyone to have an amazing experience with me as well as have timeless images they’ll cherish forever. Because of these referrals, I feel it’s only fair that I reward the loyalty with more opportunities to collaborate on additional photography sessions. Or utilize rewards to purchase that bigger album or print you didn’t get to purchase from your last session. 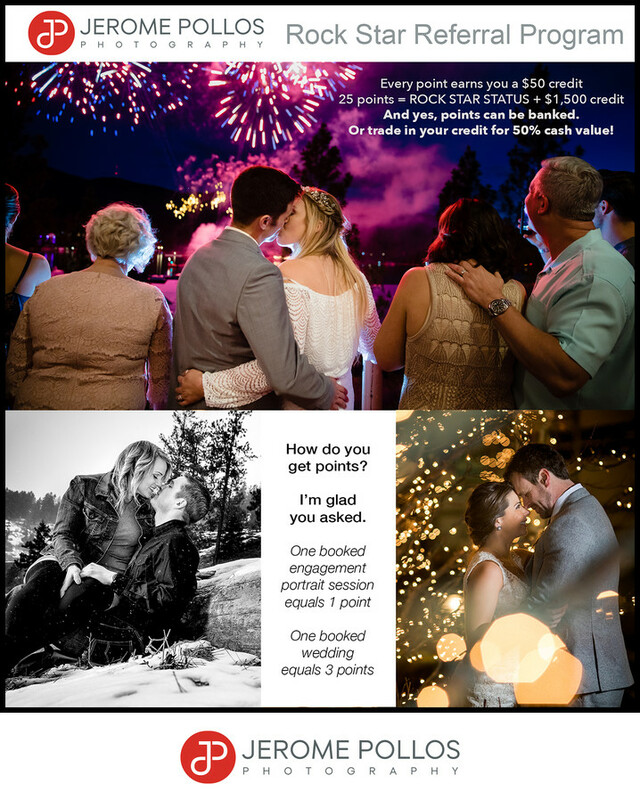 Or better yet, you can bank your points for photography for that wedding you’re planning. How you use them is up to you. If you refer someone to me and they sign with me to photograph their portrait session, you receive one point. If you refer a couple to me for a wedding and they have me document their wedding, you receive three points. Now you have points. What do you do with them now? You get to spend them. Every point you collect earns you a $50 credit to be used for my photography services and products. If you’re banking your points and collect 25 points, you earn a $1,500 credit and of course Rock Star status. And you can also transfer your credit into a 50% cash reward. So if you have $500 in credit, that is $250 in cash. Reach Rock Star status and you’ll have $750 coming to you.